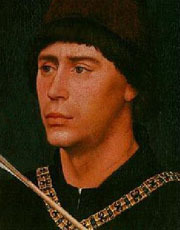 On this day in 1492, Antoine Busnois died. He was a Netherlandish composer and poet of the early Renaissance Burgundian School. While also noted as a composer of motets and other sacred music, he was one of the most renowned 15th-century composers of secular chansons. He was the leading figure of the late Burgundian school after the death of Guillaume Dufay. According to Pietro Aron, Busnois may have been the composer of the famous tune L’homme armé, one of the most widely distributed melodies of the Renaissance and the one more often used than any other as a cantus firmus in Mass composition. Whether or not he wrote the first Mass based on L’homme armé, his was by far the most influential; Obrecht‘s setting, for example, closely parallels that of Busnois, and even Dufay’s quotes from it directly. Richard Taruskin attempts to prove that Busnois’ was the model later L’homme armé masses were based upon through a study of the composer’s numerological symbology within the work, and by demonstrating that Dufay and others were emulating (or paying homage) to this aspect, among others. David Fallows points out that the complexity of the Busnois mass may indicate that he was actually borrowing from Dufay. Busnois may even be the composer of a cycle of six Masses all based on the same tune, found in Naples, on the basis of stylistic comparison. But Busnois’ chansons (French secular songs) are the works on which his reputation mainly rests. Most are rondeaux, but some are bergerettes; many of them achieved the status of popular songs, and some were perhaps based on other popular songs which are now lost. He probably wrote the words for almost all of his chansons (anticipating Wagner by four hundred years!). Some of his tunes were recycled as cantus firmus for Masses composed more than a generation after his death, for instance Fortuna desperata (which was used both by Obrecht and Josquin). An unusual chanson is Terrible dame, which is not only an antiphonal dialogue (unique in the chanson literature) but has an Old French title requiring no special skill to translate. While most of Busnois’s secular songs are set to French words, at least two employ Italian texts and one is in Flemish. Most are for three voices, although there are a few for four.